11/5, 11/7, 5/11, 12/10 (58m). 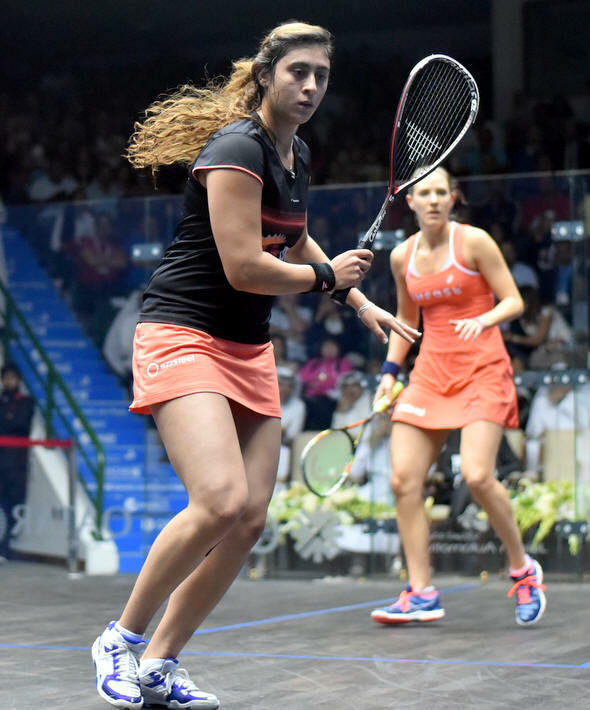 Matches between Laura Massaro and Nour El Sherbini tend to go the distance, this was their fourth consecutive five-setter ! 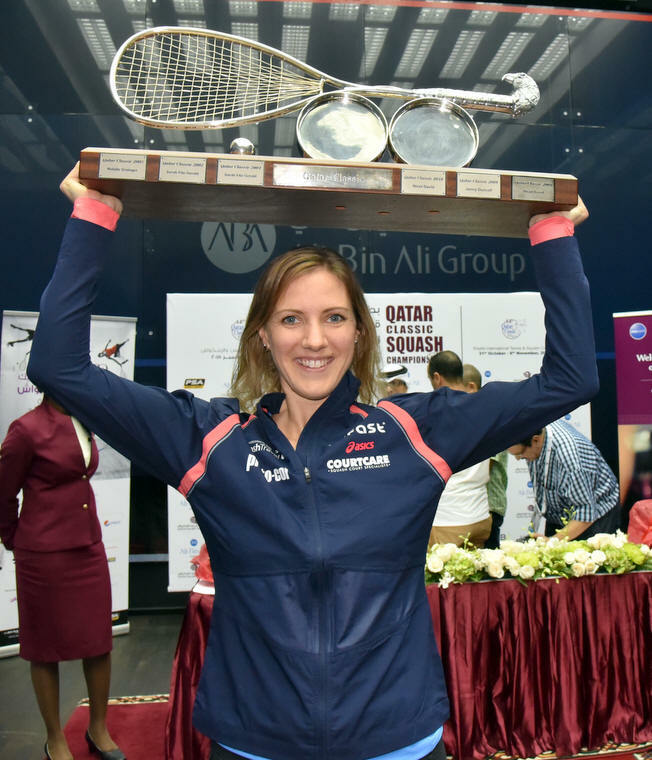 In front of a packed and partisan crowd at the Khalifa Tennis & Squash Complex in Doha it was the Englishwoman who prevailed, coming from 4-7 and 5-8 down in the fifth after four pulsating games had been shared, to collect her second World Series title in the space of a couple of weeks. "It feels amazing to win in front of a crowd like this," said Massaro, 32 years of age compared to Sherbini's just-turned 20. 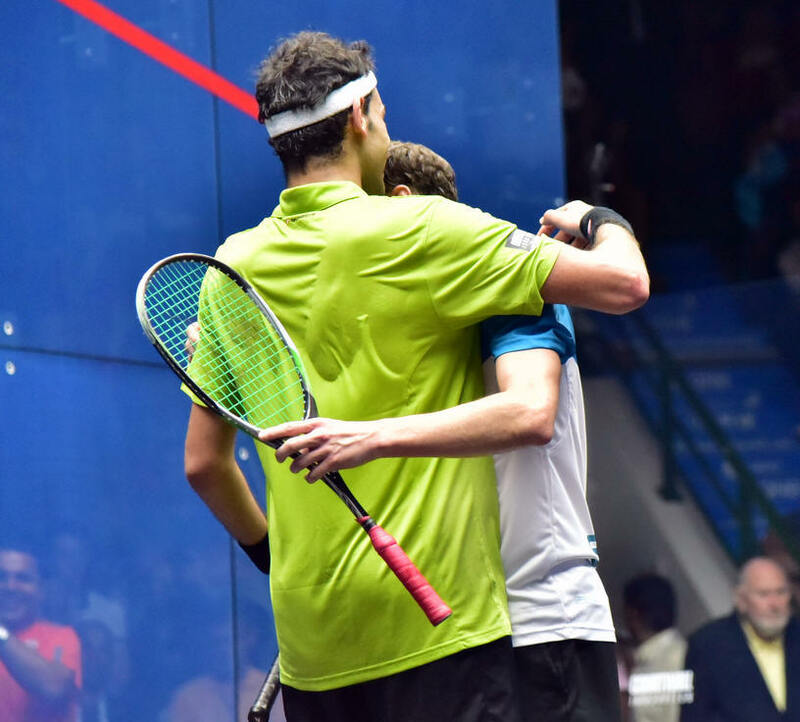 "Nour is going to be such a great players, I'm just happy I managed to sneak the win while I still can." In the men's final, between the last two Qatar Classic champions - Mohamed Elshorbagy in 2013 and Gregory Gaultier in 2011 - it was the Egyptian world #1 who prevailed in four games. Dominant in the early stages, Elshorbagy took the first with something to spare and then pulled away from the middle of the second. 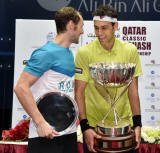 Gaultier stepped up a gear to take the third, and a held 9-4 advantage in the fourth before a determined comeback by Elshorbagy, noisily urged on by the partisan crowd, pegged him back before retaining the title on his second match ball. "He gave me a few cheap points in the fourth, and I was lucky to sneak a victory," said a delighted winner. As the Egyptians would say, Chapeau. It means hat to you my dear Laura. What you produced today was nothing short of a miracle. 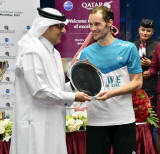 You managed to overcome probably the World number 1 in what, 2 years? 18 months? 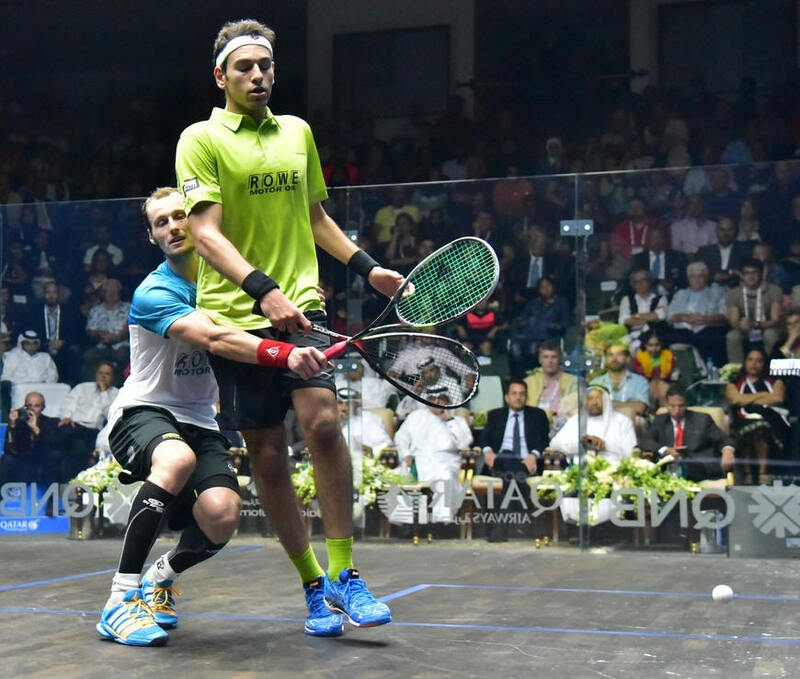 You did it with flair, and class, and guts, and experience, varying your shots, height, weight in the ball, adapting your squash and digging deep into your inner soul I’m sure of that. Imagine a circus, raging with Lions all around you, all ready to eat you alive. A few tigers around them, not many, but roaring loud enough for you to feel you are protected. And in the middle, two stunning ladies, different styles, ages, cultures, but with two common point: Their hunger for victory and incredible skills. Close was the first chapter of our book tonight, on a court much warmer than the previous night, the place being packed from the rafters! 2/2, 4/4, 7/7, 8/8. 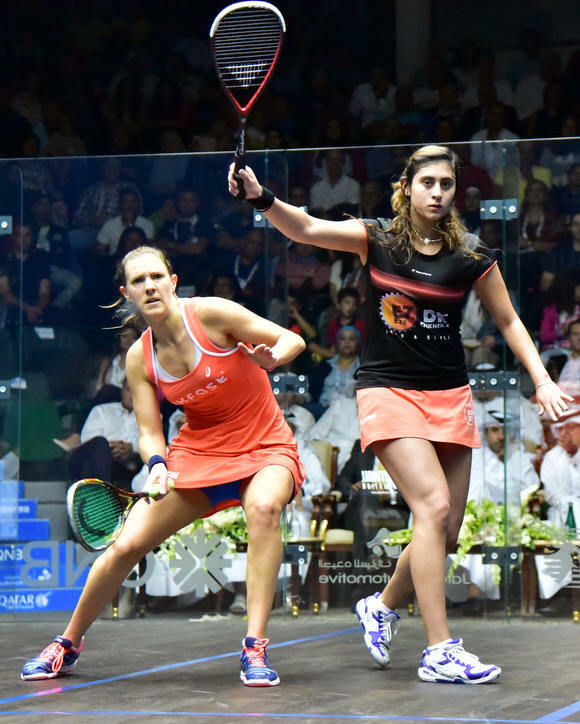 Looking at Nour, I see her left hamstring taped in pink, and the right adductors in blue. Different colour to make sure the physio doesn’t get it wrong. 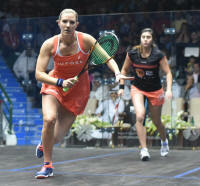 She is moving fine though, except at the end of the game, where Laura just uses the court to perfection, finding winners at the front and at the back, 11/8 in 9m. 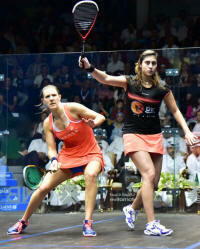 The second is a classic, Laura is up all game, 5/3, 7/4, 8/5. 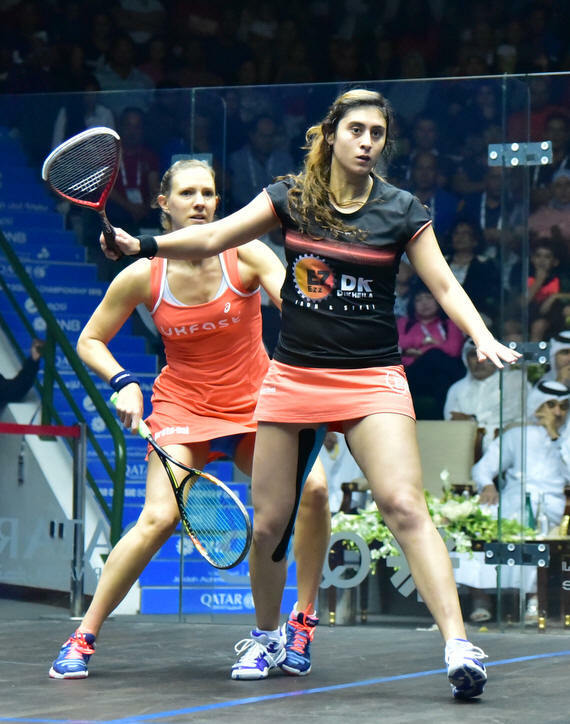 Nour finds shots from nowhere, the crowd chanting her name must have something to do with it, and score 5 points straight. 8/8, 9/9, 10/9 Laura. 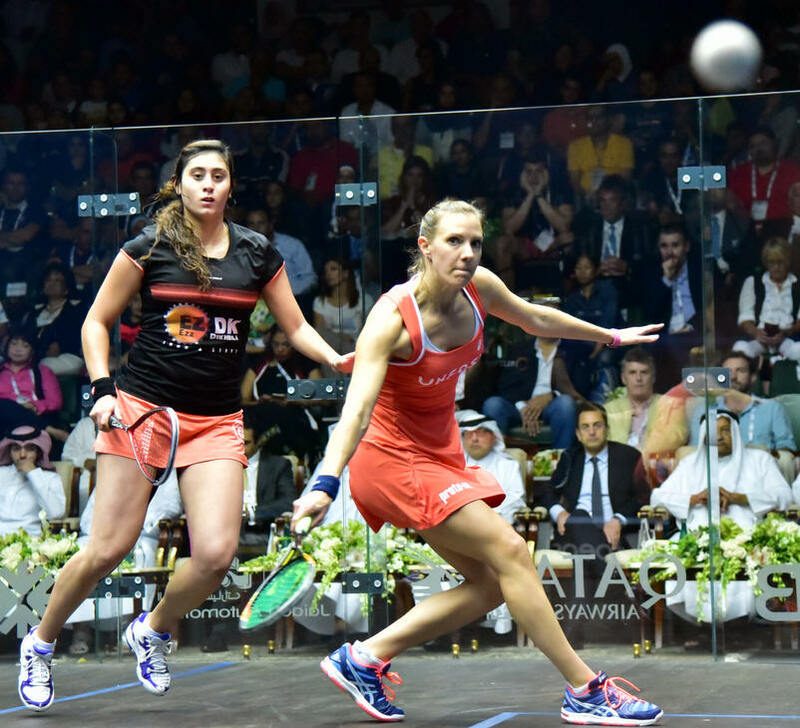 But she won’t be able to close that one down, with the help of 5000 people chorus carrying the young Egyptian to 14/12, in 17m…. The third is crucial really, the ball has now soften a lot, rallies are shorter. 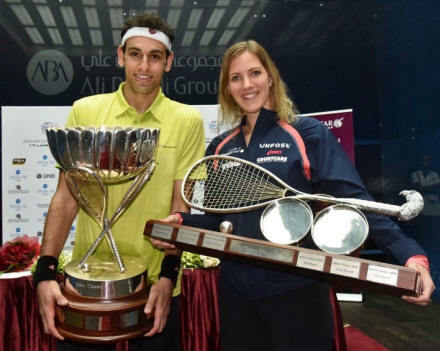 It’s good for Nour, but it’s good for Laura as well, who manages to find exquisite winners. Very close again, 2/2, 4/4, 5/5. Laura ahead, 8/5 again, Nour tries to claw back, 7/8, but this time, after two video review at 10/9, the English lady takes it, 11m, 11/9. Is that it? The crowd won’t have it. And again, they will carry the young girl from 10/6 to 11/8 in 11m, against a Laura that seems completely lost on there, making uncharacteristic errors, not going for the ball, visibly in distress, and even looking at her husband at 6/8 when she tins the ball. That doesn’t happen. And even the desperate “Come on Laura” from Danny and a few English supporters that make themselves heard, Laura seems lost at sea to be honest. And she really out of the match up to 5/2 in the decider. But as she does – she did it to Nicol so many times – the Lady just plants her teeth in her racquet and climbs the Mountain, step by step. 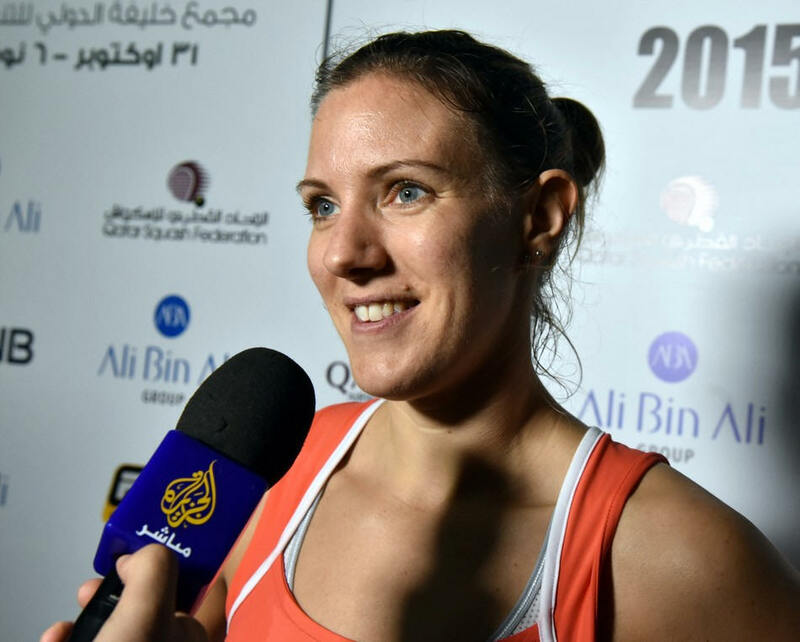 At 5-8 down in the fifth Laura "made a decision I was going to win it" will tell her husband at the end. And that she did. 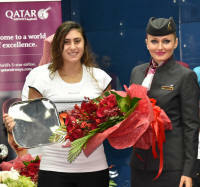 She forced errors of Nour, grinding her confidence, point per point, and from 7/9, she will ineluctably score the 5 points needed to win her first ever Qatar Classic, shame that the last point ended on a no let that seemed very harsh to me, but confirmed by the video ref. Nour had the guts and game of a champion today, but Laura had that English Rollercoaster Energy coming from her, like it exudes so often from Nick Matthew. 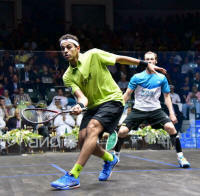 But I’m glad to say there were a few English people in the crowd, it made the difference for me tonight, even if they were outnumbered by the Egyptians support that gave me a hard time tonight!!!! 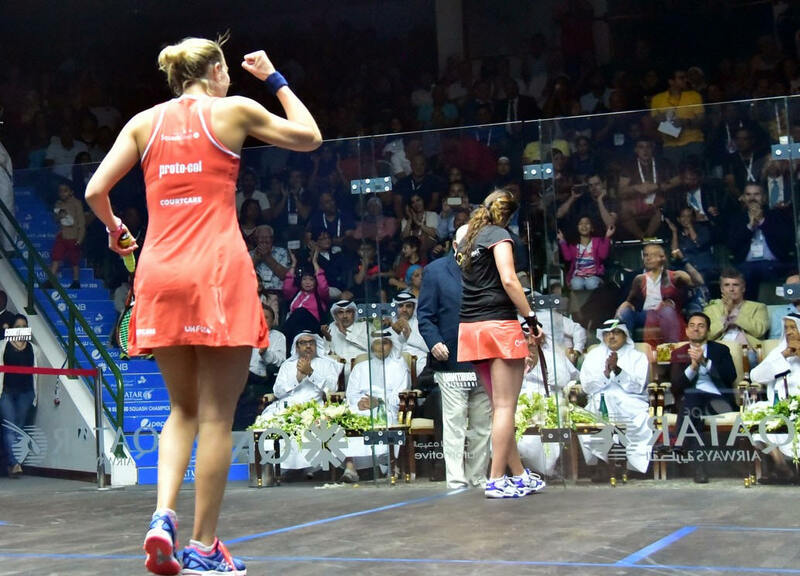 But compared to Alexandria, where it was really an entire Egyptian crowd, and only my husband Danny to support me, this was a big change!!! I wish this support would follow me at all times!!!! I think that there was a little bit of a change in tactical plan in the end and then a bit of a momentum shift and it was enough to carry me over the line. There was only three or four points left at that point and I don’t think that there was enough time for her to adjust to that. There were a couple of tins by her but they were forced by a bit of a change tactically from me I felt. She is going to be an amazing player. 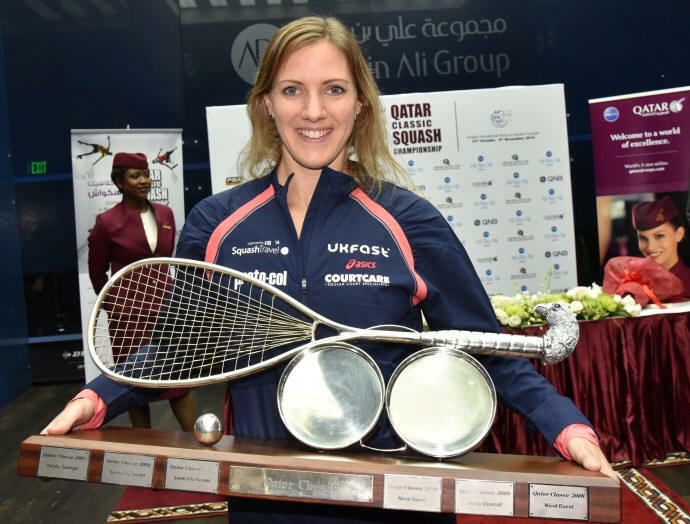 She’s already played a World Championship final, a British Open final, a Qatar Classic final and she’s been at four or five in the world at her highest. I’m just glad I keep managing to sneak those wins while I still can because she is going to be one hell of a player in the future. 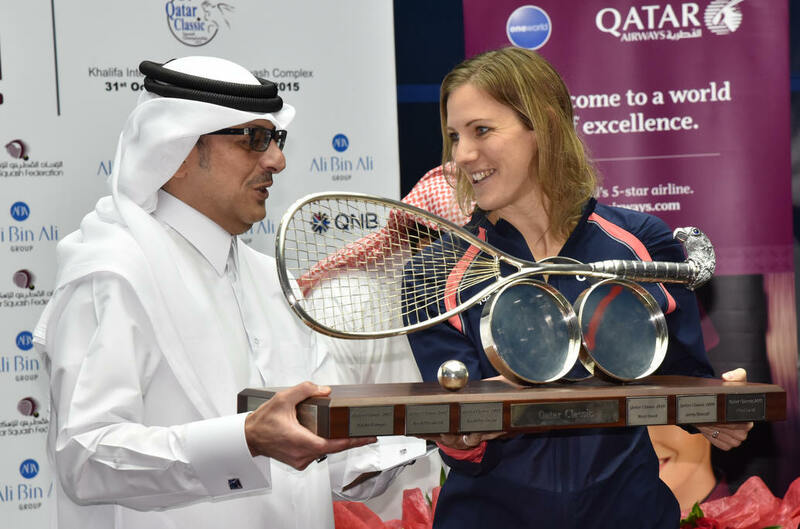 I really want to thank the Qatar Federation for their support, the fact they brought back the women to Qatar is massive, absolutely massive for us, so thanks to the Federation, their President Mr Ali Bin Ali, and all the people that have made this tournament possible. 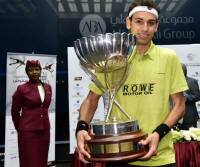 There’s a lot of great names on that trophy so it’s a great feeling to know that my name will go along side them now. It’s amazing to win another major trophy - I’m over the moon. This has been a very good week for me. Today, she was playing very well from the first game, she was the better player today. She is a very experienced player and she has been in this kind of situation before. That’s just what she can do. I’m happy with the way I played tonight and hope that next time I can make it to the title. This was not a normal match. This was a ballet, a choreography, this was a feature film, a boxing match in the 15th round when both are bleeding and none want to throw the towel. 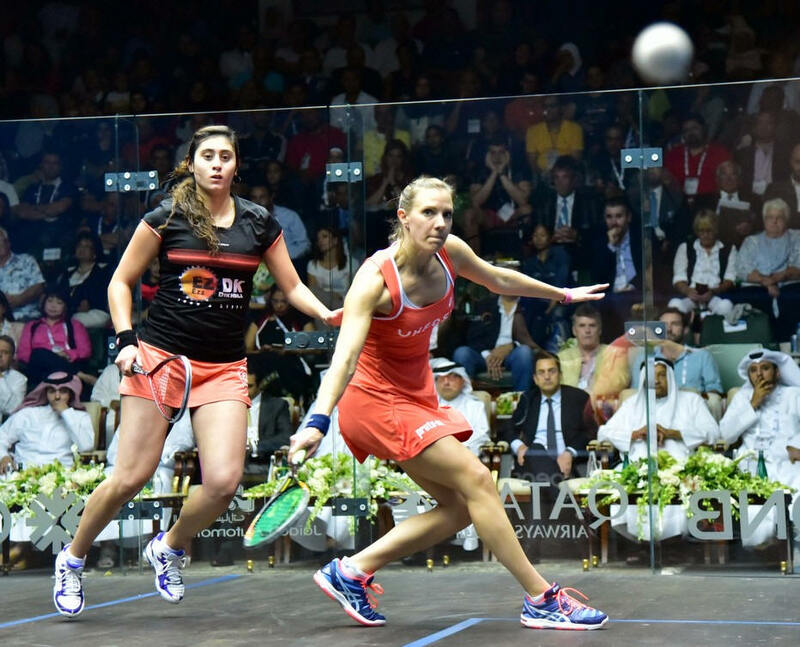 It was mesmerising, it was cruel, it was beautiful, it was… squash. Like Mohamed said, Greg arrived here, extremely tired, and what made it worse was that he couldn’t sleep at all. Last night, one hour. The night before, about 5. The night before, not all all. Weird what the consistent change of time zones can do to a body… Today was the end of the road, and Greg started the boxing match groggy from too many punches. Mohamed was nervous. I could tell. Yes, he was the hot favourite, Mohamed doesn’t enjoy that too much. He likes the fight, he likes being the underdog, although he fully appreciate being at the top of the world… Pressure, pressure. Greg basically didn’t show up in the first two games, bless him, 20m gone. 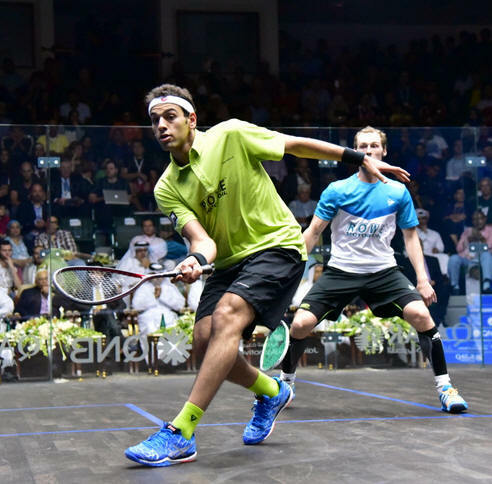 Plenty of unforced errors, no winners, just passive and letting the court opened for Mohamed to punishing him. Flat as a crêpe… Pancake if you’d rather…. Greg is Aliiiiiiive!!!!! He gets into his grinding Mohamed mode, you know the drill, making the rallies verrrrry long, glued to the side wall, forcing him to rally on the backhand endlessly, then make him attack from not good positions, and finding lovely volleys, just above the tin. In other words, frustrating the heck out of Mohamed. 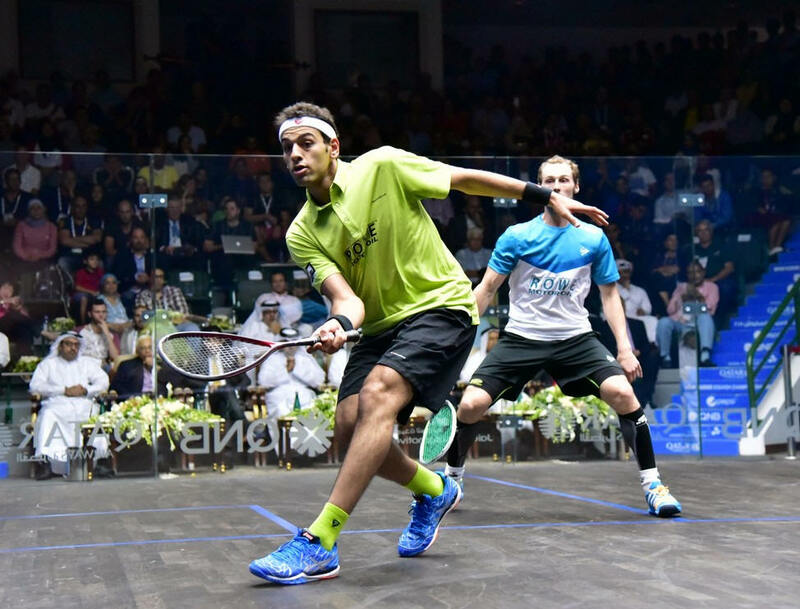 The Frenchman, against all expectations, takes the third, 11/5. 11m. The crowd is stunned. 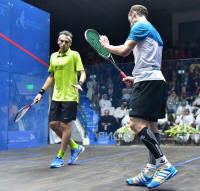 And when he comes back on court, I see him look at the crowd. “You don’t scare me”, he seems to say. It’s subtle, but it’s there, believe me. And he’s got into Mohamed’s brain, into his skin. 3/0, 5/1, 7/3. But that’s where the accumulated tiredness comes into play. Greg starts losing a few points, I write “tired” at 9/5. And I’m sooooo right. The crowd feels it too. Mohamed is back on top. 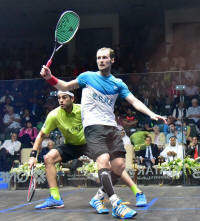 He starts stringing the points, 6 to be exact, to get to match ball, 10/9. An anthology rally there, won by a roaring Greg, 10/10. 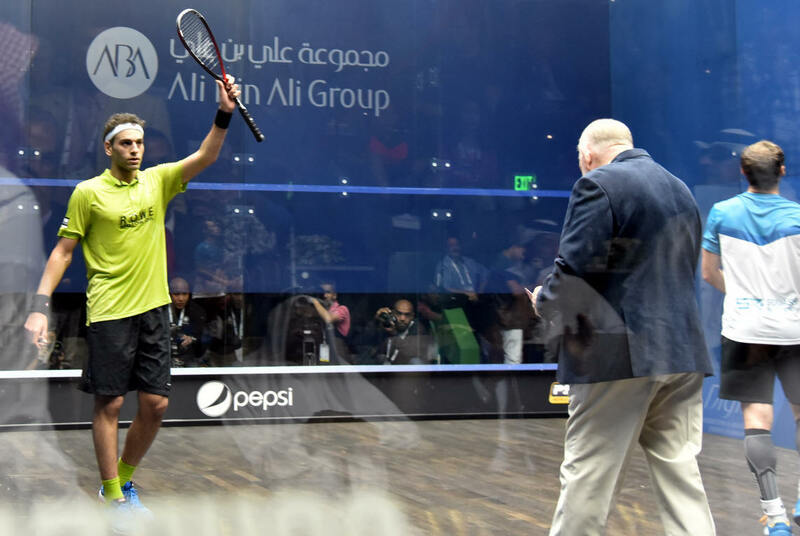 A Sublime backhand crosscourt that Greg cannot return, and the crowd – whose been chanting SHORBAGY since 5/9, can be heard back in Alexandria! Second match ball, and that’s the one, 12/11. They both fall into each others arms. 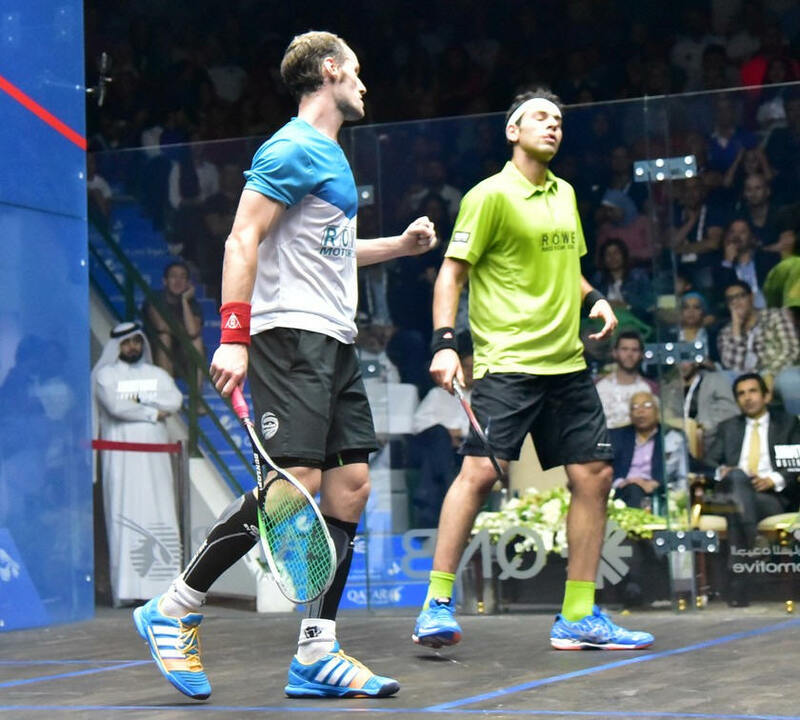 Greg is smiling and truly congratulates Mohamed, like he did in El Gouna the first time Mohamed managed to beat him at last. It crystallises the spirit of this match, where no refs were needed really. 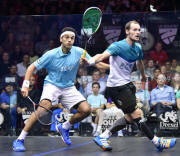 Both calling their not up, their down, no blocking, no taking the other one line, clapping their opponent shots. 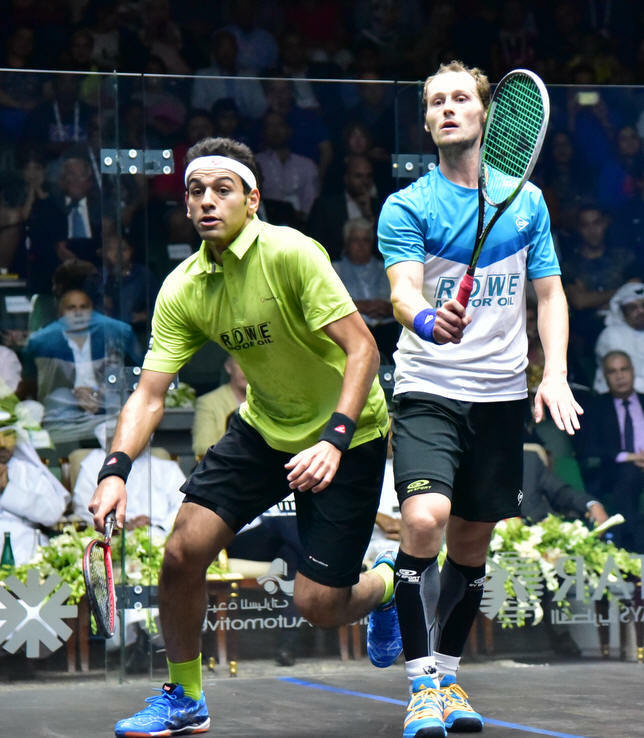 I tried my best today, I had to come back every match this week, I had a few sleeping pattern troubles, but that doesn’t take anything away from Mohamed, he played so well from the start. I tried to stick to the score, but he played so well in the two first games, I tried and give it a big push in the third, and I let him come back in the 4th. Maintenant quelques jours à la maison pour se ressourcer et faire le plein d’énergie avant le Championnat du monde. Merci à toute mon équipe pour le travail au quotidien qu’ils font pour moi, mes amis et famille, tous les fans pour leur soutien. What Greg did today proves if needed the great champion he is. Everybody could see from the first shot of the first match how tired and flat he was. How he got to the final is a mystery to me. Yesterday, I was watching him play and I thought that I would like to be able to push myself that hard when I’m down and out!! He was completely flat in the first two games, I knew that could happen, I knew that his movement could be a bit sluggish, but I also knew it would get better as the match would advance. After that, in the 3rd, he started playing tight squash, he frustrated me, he showed great experience at the point, and he knew he would frustrate me. 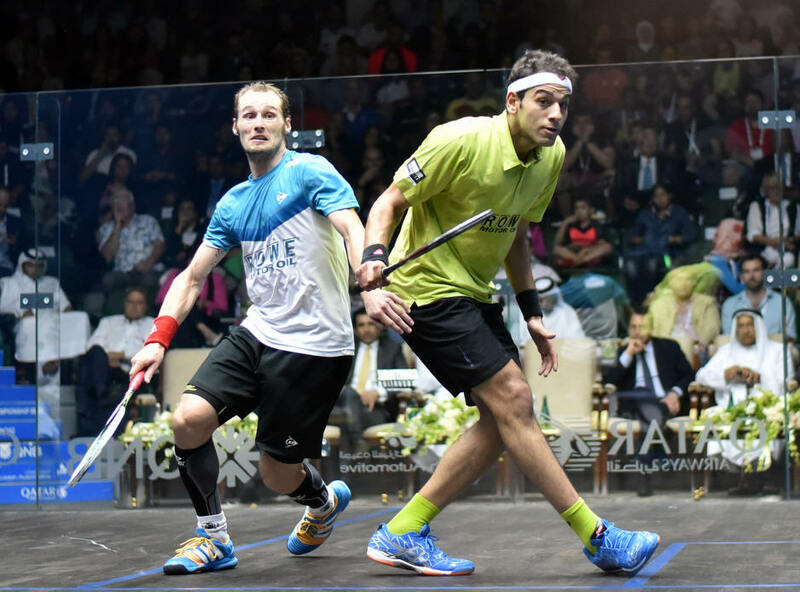 But in the 4th, he gave me a few cheap points, the crowd stepped in, and I’m lucky to sneak a victory at the end. 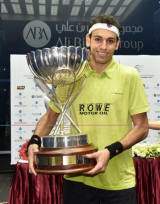 But just stepping on court with such a champion is an honour for me. 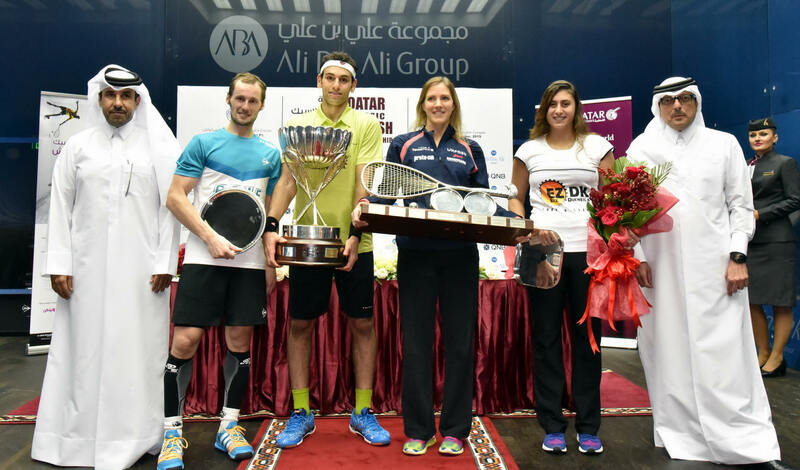 I want to thank my parents for the support the gave in Qatar, and always. I feel that Greg and myself are the best players in the world at the moment, the ones that are playing the most consistently, day in day out, all the tournaments. We are both up for the World Title of course, we’ve both got our eyes on it, and such a victory one week before the Worlds is a great confidence boost for me. 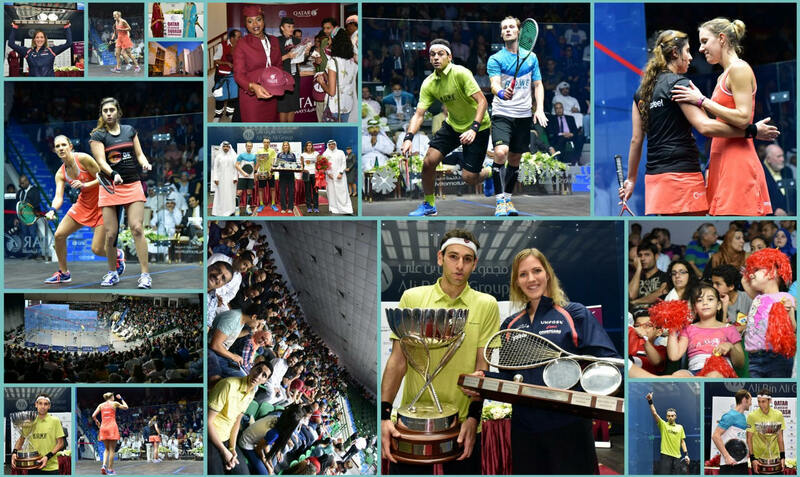 Finals day at the Khalifa Tennis & Squash Complex in Doha, with a packed crowd set to witness two terrific finales, both with Egyptian interest. 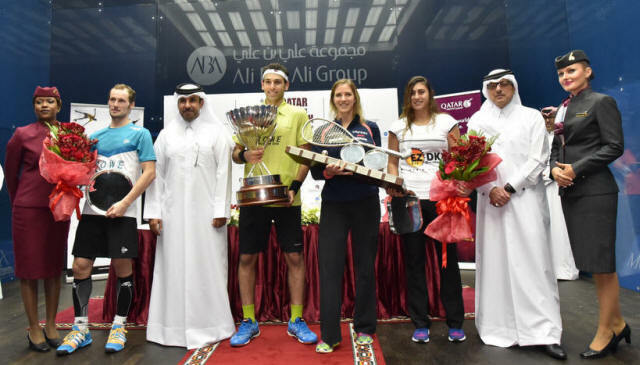 Laura Massaro and Nour El Sherbini will replay their 2014 World final, while top seeds - winners of the last two Qatar Classics - Mohamed Elshorbagy and Gregory Gaultier will battle it out for the men's title. 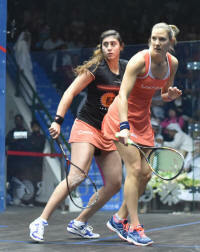 The women's final will be Massaro's second World Series final in a row, having won the U.S. Open last month. Both are appearing in their first Qatar Classic finals, for Massaro this is her 10th event, for Sherbini just her third. 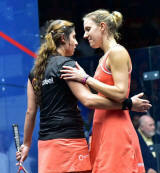 Massaro leads 3-1 in their matches to date, the only final of those three being the World Champs in Malaysia last year. They've met twice since with one win apiece, Massaro in the 2014 U.S. Open and Sherbini in Alexandria earlier this year, and each of those last three have gone to five games. Both men's finalists have been in Qatar final before - for Elshorbagy it's a fourth final in a row - 2012 and 2014 were World Champs held here and he won the title in 2013, for Gaultier, like Massaro competing in his 10th Classic, it's a third final having been runner-up in 2007 and champion in 2011. 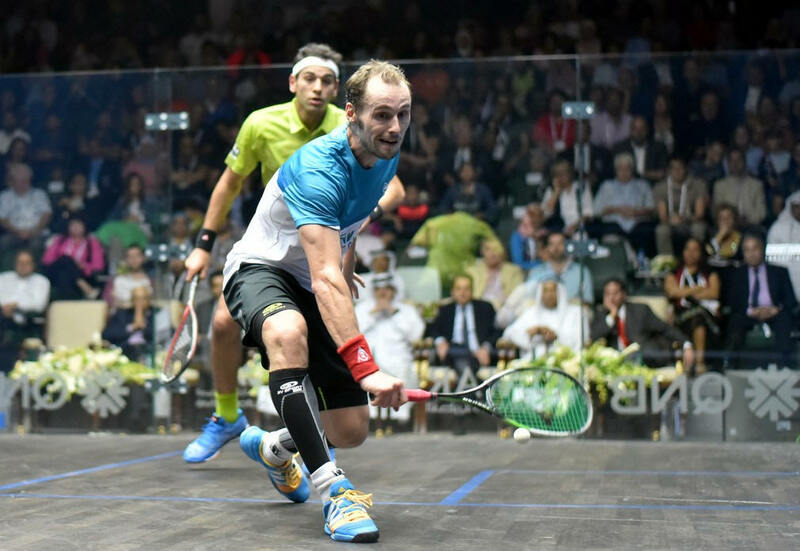 In the H2H the Frenchman leads 10-5, but after winning their first 9 encounters, last month's 3-2 win in the U.S. Open semifinals stopped a run of five 2015/15 wins in a row for Elshorbagy.